Little rewards for big successes! These chart-sized stickers are perfect for TREND's Incentive Pads. Acid-free, non-toxic, and safe for use on photos. 800 stickers in six different designs. Q: This says "chart size sticker." How big is this? Each sticker is about 1/2". 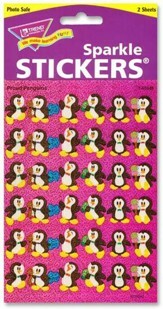 I'm the author/artist and I want to review Perky Penguins SuperShapes Stickers.